Tree Service for King county, including Bellevue, Redmond, Sammamish, Issaquah, Kirkland, Woodinville, Bothell and Eastside. "When Quality is Your First Priority"
We are extremely proud of the reputation that we have built over the past decade, and the relationships that we have formed with our customers. We do whatever it takes to make you happy and our reputation proves that! But don't just take our word for it, take our customers word! If you are looking for an honest, professional, relationship oriented tree service company, and not just the cheapest company you can find, we are the company for you. "The best decision I ever made! John and Doug are wonderful. They are friendly, affordable and professional. I wouldn't use any other tree service even if someone paid me. "It gives me great peace of mind to know that the owners do all the work and are on every job site. 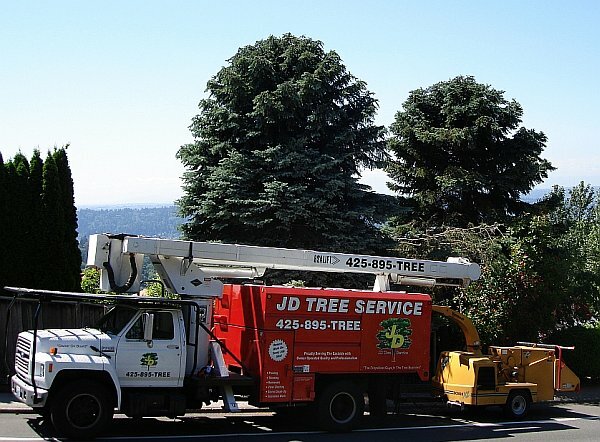 Thanks JD Tree Service for serving the Eastside with such friendliness and professinalism!" "Highly recommended because they go above and beyond what I expected. I recently had them remove a dead tree, part of which had fallen across our driveway. I called them up and that same day, they came out and took care of the tree for me. I had called a couple other tree services who told me they'd charge an "emergency fee" for coming out the same day I called, but JD Tree Service had no such ridiculous fee. They came out and within an hour, our driveway was cleared and it didn't take long for the rest of the tree to come down too. I am extremely satisfied and will definitely hire them for any future tree work I need done." "I used JD Tree Service to cut down few trees in my yard. I am extremely happy with their services. They were able to give a good estimate. We made few changes last minute. They were able to handle all changes with no push back. They did a very clean job and communicated throughout so I knew what they were doing. I highly recommend them." "Notably good service experience. These guys are the best! They took out five or six large fir trees for my mom and did a great job. They were knowledgeable, easy to work with and very warm and friendly. We loved them! Not only that, but when I asked them what they would charge to trim two very long fir trees from a neighbor's tree that were shading a corner of my yard, they came down to my house and cut them for free!!!! They offered advice on trees to both my mom and me. You do not find this kind of customer service anymore in ANY business!" "A local favorite of mine. I recently used JD Tree Service for the third time in the last three years. They do a wonderful job. I have numerous tall trees in my yard and I have those guys come out every summer to limb-up those trees to let more sunlight into my yard. I am more and more impressed with their fantastic work each time they come. They are by far the best tree service on the Eastside. It took me some time to find someone I can count on, but I found them at JD Tree Service and I will never use anyone else!" "We've used JD Tree Service twice now. They do an excellent job--owners are at every job. Careful, efficient, great about cleanup. I would definitely use again. Might be priced a smidge higher than some tree services but well worth it." "I hired JD Tree Service to remove an alder tree and prune 3 japanese maples and a plum tree. The whole experience was great. They were very careful removing the big tree and did a beautiful job with the pruning. Their clean up was very thorough as well. John and Doug enjoy their work and are both very personable and professional. They really made me happy and I would highly recommend them." "JD Tree service is the best tree service I've ever used. I discovered them 7 years ago when they were working for my next door neighbor. I asked them to come over and look at my ornamental trees for me. They explained how the topping cuts my landscaper had made were bad for my trees and what they could do to correct the damage. They were very knowledgeable and friendly. I hired them that day and they started working on my trees the same day. I have had them back to do my pruning ever since and my trees look better than they ever did. I have also had them remove 3 big trees. I really appreciate how they do all of their own work and don't just send different crews of guys to work on my trees every year. I know I will get consistent quality with John and Doug and I really appreciate that and feel good about referring them." "We were extremely pleased with the work John and Doug did on our trees! They took down a few diseased trees and expertly pruned the remaining ones. The yard looks great! They showed up on time, did a great job and thoroughly cleaned up before they left our property. You won't find a better tree service." "I was a little skeptical seeing only perfect reviews for JD Tree Service, but they certainly lived up to the reputation. My new house needed a lot of work, removing and pruning trees. During the estimate they not only pointed out areas that needed attention, but also told me areas that didn't need any work. I was happy that they were willing to turn away work when they felt it wasn't necessary. They came on time, worked efficiently and got the job done. I'm very happy." "Outstanding work...John and Doug are great guys. There's no doubt in my mind that they are the best tree service on the Eastside. They took great care in removing the dead fir tree in my backyard. None of the landscaping below and around the tree was damaged, and I could tell they took great pride in their work. I couldn't be happier with my decision to hire them. They're a breath of fresh air in their field, no one like JD Tree Service, thanks guys!" "Honest, Expert Knowledge and Friendly. They were timely, honest and very professional. They completed all the work and did a Great job and cleaned everything up when they were done. I couldn't be happier. I love finding a business that does a GREAT job for a fair price. I am glad that I called JD Tree Services and wouldn't hesitate to use them again or recommend them to friends. Thanks Guys"
"Best Experience! Thanks for a job wonderfully done. My husband and I are thrilled with the beautiful job you did limbing up our overgrown trees and the advice you gave us on maintaining them throughout the years. It is so refreshing to work with such honest, professional and friendly guys. Thanks again John and Doug!" "I recently hired JD Tree Service to remove several birch trees from my yard, 2 of which were dead. I could not be more pleased with the decision to hire this company. From start to finish, I felt like I was in extremely capable hands. Not only do the owners do all the estimates themselves, they do all the tree work themselves as well! I cannot count how many times I've hired contractors who've sent out a very respectable estimator and then on the day of the job a not-so professional crew shows up to do the actual work. I am delighted by John and Doug and have found a tree service I can depend on for quality, honesty, and affordability, not to mention friendliness." "We called JD Tree Service out to remove a huge old cottonwood tree severely damaged in the last snow storm. It was a two trunk tree and one trunk broke off and fell in our yard and the other trunk was partially uprooted. The uprooted tree was so precarious they couldn t climb it so John had to repel over from another tree to take it down! He did an excellent job protecting the landscaping underneath it. We were impressed with both John and Doug who are the owners. They do all of their own work and are very friendly and professional. They also inspected several other trees for us and didn't try to scare us into removing any of them like those door-to-door companies do. We appreciate their honesty and hard work and will definitely be hiring them again." "Excellent service! Doug and John are great to work with. They are extremely responsive and do great work. We will definitely be using them again soon. Thanks, JD Tree Service!" "Professional, efficient, and always on time. They do a wonderful job. Owners do the work. John and Doug are very knowledgeable and answer all my questions. I have used their service many times and will continue to do so. Thanks Guys!" "Amazing job! I had a group of alder trees growing near my deck whose trunks were rotting out. I hired John and Doug to come and take them down. It was the best decision I ever made. They expertly removed the trees without damaging anything. Except for the stumps, I wouldn't even have known they had been there. Thanks guys! I will definitely use you again!" "John and Doug are the perfect team. We had a giant maple that they took down like it was effortless. They worked hard, clean, efficient and cleaned up beautifully when done. I would recommend them to anyone looking for peace of mind in a tree service. Thanks guys!" "You did an outstanding job....you are fearless! Thanks again for a job well done." "Thank you for the good work on the trees - I am happy with the way they look!" "You did a GREAT job - thank you for your professionalism! I will refer you on." We are professional, trained members of the International Society of Arboriculture. We are a fully licensed, bonded and insured. We have a perfect, unrivaled safety record, and have never had an insurance claim. We personally perform all of the technical work on every job site. "Outstanding work...John and Doug are great guys. There's no doubt in my mind that they are the best tree service on the Eastside. They took great care in removing the dead fir tree in my backyard. None of the landscaping below and around the tree was damaged, and I could tell they took great pride in their work. I couldn't be happier with my decision to hire them. They're a breath of fresh air in their field, no one like JD Tree Service, thanks guys!"